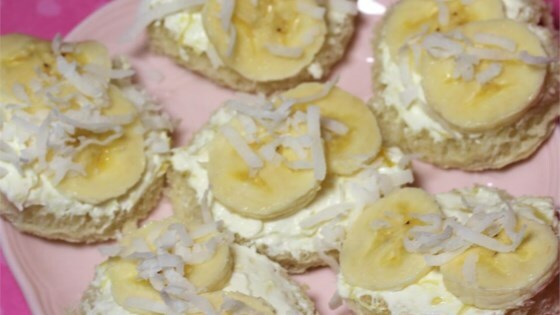 "This tropical treat makes a delicious lunch or afternoon snack. If you are not cooking for a crowd, just refrigerate any unused pineapple and cheese mixture for another time." In a small bowl, mix together softened Neufchatel cheese and pineapple. Spread cheese mixture on one slice of bread, top with slices of banana and a sprinkling of coconut, and top with another slice of bread to make a sandwich. Repeat with remaining ingredients. I skipped the banana and added ham for more of a substantial meal. Perfect snack for someone like me who loves to eat healthy and has a sweet tooth! I added half a tsp of pineapple juice and used marscapone cheese.